Searching for a kind of music that could tell of a country, unknown to many, Mario Ferraro found the sounds from his childhood in the interior of Brazil. Libretto inspired by the material from Margaret Mee: In Search of Flowers of the Amazon Forest by Tony Morrison (Nonesuch Expeditions) and The Burning Season by Andrew Revkin. The Moonflower is a fusion of contemporary opera, theatre, circus and video art, inspired by the lives of two remarkable figures: Margaret Mee, a British botanist and artist explorer, and Chico Mendes, a Brazilian rubber tapper, environmentalist and human rights activist. Margaret and Chico meet as spirits in the afterlife. Their love of the Amazon rainforest inspires a journey full of magic and mysticism, but also of human struggle, love, greed, and above all, the undying nature of the human spirit. Deep in the flooded forest we re-discover the Moonflower, or the Queen of the Night. She opens once in a blue moon and dies with the first morning star. Her life is short but so precious and beautiful it is worth fighting for. The Moonflower is the leitmotif, holding the whole piece together. Composed by Mario Ferraro, written by Eva Daníčková, and directed by Maja Milatović-Ovadia, this opera gathers an international team of artists from four continents in celebration of cultural diversity. Mario Ferraro: Musi Mario came from Rio de Janeiro, where he developed a career of theatre musician until 2000. Since then, his classical music has been performed both in Brazil and internationally. Having been awarded a full sponsorship from the Brazilian Government, Ferraro is concluding his PhD in Composition at City University, London, with a research on Contemporary Opera. Eva Daníčková: Words Eva studied theatre at London Metropolitan University and dramaturgy at the Central School of Speech and Drama. 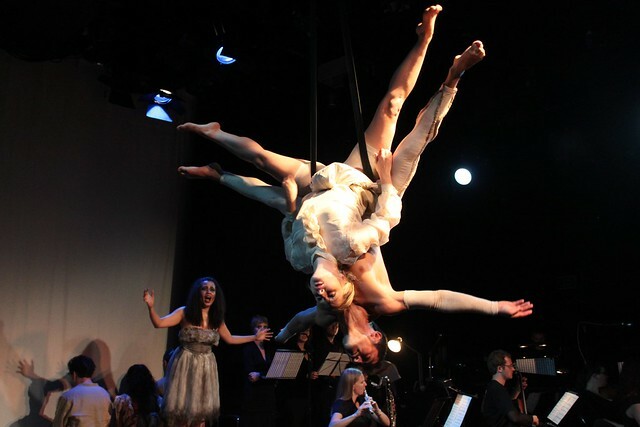 Eva established Boii Theatre in 2010, a collaborative ensemble of artists from various backgrounds. She specialises in play translation (Royal Court International Residency 2010) and works as a dramaturg within devised theatre. Eva wrote The Moonflower in collaboration with Mario Ferraro. Maja Milatović-Ovadia: Director Maja is freelance theatre director that has been working extensively in theatres throughout Europe and UK. She was associate director at the National Theatre in Serbia and at the Blue Elephant Theatre for the Balkan Season. Maja was awarded the A.G. Leventis Foundation scholarship and a Hugo Klein award for Theatre Directors. Andrew Morley: Conductor Andrew studied at Lancaster University and subsequently won a Scholarship to Trinity College of Music, London where he graduated with distinction. In February 2004 he was awarded first prize at the Allianz-Cornhill Musical Insurance Conducting Competition having received unanimous votes from both jury and orchestra. Fabricio Mattos: Guitar a very active guitarist, Fabricio Mattos plays constantly worldwide. He played a world tour in 2011 as part of the Worldwide Guitar Connections, besides many other tours and recordings in the past years. Graduated from EMBAP, Brazil, attended to the Masters at the RAM in London, and won many important awards in his career, such as “Julian Bream Award”. Maya Sapone: Lua a versatile performer with exceptional vocal flexibility and improvisational skills Maya Sapone was born in West Africa to a Thai mother and Italian father. Creative associate of Elastic Theatre, Maya’s activity ranges from opera to musicals, experimental theatre and music for film and television. Following her critically acclaimed performance as Lady Thiang in the Rodgers and Hammerstein musical, The King and I, soon, Maya is leaving on a six-month UK tour as part of the same cast. Berislav Juraić: Producer Berislav has extensive international experience. His productions have toured in the Middle East, Europe and South America. Recent London credits include the UK premiere of Woman Bomb at Tristan Bates Theatre, Pagliacci at Londons’ Little Opera House and Time Out Hit of the Year Pins and Needles as well as the acclaimed Edward Bond Season. Mafalda Cruz: Video designer Mafalda is a creative artist specializing in theatre, film and performance arts. Originally trained in Fine Arts, she is based in London after finishing MA ATP at the Central School of Speech and Drama. During her career she has worked in a wide variety of disciplines including set design, film, illustration, sound, animation, sculpture, creative writing and photography. Ricardo Gomes: Lighting designer Ricardo is a lighting designer graduated from the School of Fine Arts and Design of Caldas da Raínha in Portugal in Sound&Image. He worked at Valentim de Carvalho Studios as a camera and lighting assistant for more than fifty entertainment shows like Portuguese Idols, Portugal’s got talent, music videos and live concerts like Rock in Rio Lisbon. studying the MA Scenography at CSSD.